Journalists from the New York Times, CBS News, the Washington Post and Univision are among the participants of a new medical journalism program created by Mayo Clinic and Arizona State University’s Walter Cronkite School of Journalism and Mass Communication. At Mayo Clinic, fellows are attending sessions on regenerative medicine, augmented human intelligence and other medical innovations and will participate in a hands-on experience that simulates the high-pressure situations that doctors face in emergency and operating rooms. Instructors include neurosurgery expert Dr. Bernard Bendok, women’s health internal medicine expert Dr. Jewel Kling and critical care expert Dr. Ayan Sen and neurologist Dr. Joseph Sirven. 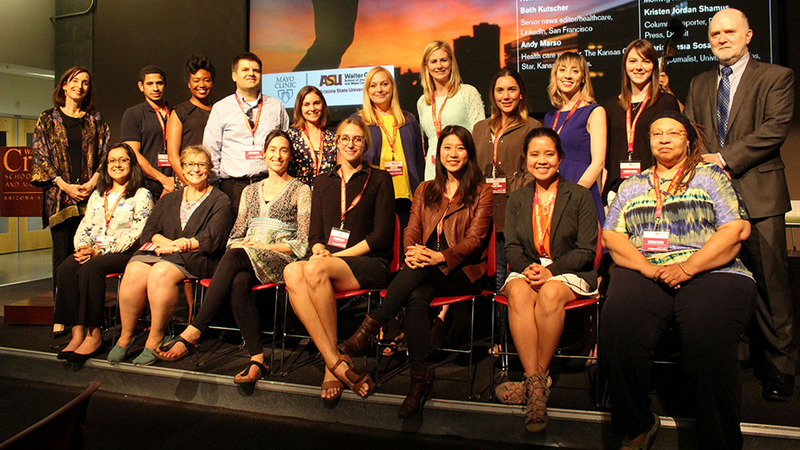 At the Cronkite School, fellows are engaging in in-depth workshops on data journalism, narrative writing, video storytelling and social media and digital metrics, among other topics. The program is being led by Julia Wallace, the Cronkite School’s Frank Russell Chair and former editor-in-chief of The Atlanta Journal-Constitution. Professors from the Cronkite School include Pulitzer Prize-winning editor Sarah Cohen; Weil Family Professor of Journalism Leonard Downie Jr., the former executive editor of the Washington Post; Pulitzer Prize-winning investigative journalist Jacquee Petchel; analytics expert Jessica Pucci; and former New York Times Phoenix Bureau Chief Fernanda Santos. The fellowship is part of the Mayo Clinic and ASU Alliance for Health Care, a transformative research partnership designed to improve all aspects of health care delivery through research and collaboration. Announced in 2016, the partnership aims to transform medical education and health care in the U.S., helping doctors reduce costs, simplify the system and save more lives. Lindsey Bever, general assignment reporter, the Washington Post, Washington, D.C.
Ashley May, multiplatform producer, USA Today, Washington, D.C.